The new announced Voigtlander Nokton 50mm f/1.2 Aspherical Lens for Sony E mount now already in stock and shipping at Amazon, also available for pre-order at Adorama/B&H Photo Video. Author adminPosted on April 20, 2019 Categories Mitakon Zhongyi Lenses, Sony E-mount Lenses, Voigtlander FE LensesTags In Stock, Mitakon Zhongyi Speedmaster 50mm f/0.95 Mark III Lens, Pre-order, Voigtlander NOKTON 50mm f/1.2 Aspherical E-mount LensLeave a comment on Voigtlander Nokton 50mm f/1.2 FE Lens now In Stock, Mitakon Speedmaster 50mm f/0.95 III Lens Available for Pre-order ! Author adminPosted on December 5, 2018 December 5, 2018 Categories Sigma E-mount Lens, Sony E-mount LensesTags In Stock, Sigma 56mm f/1.4 DC DN | Contemporary LensLeave a comment on Sigma 56mm f/1.4 DC DN Contemporary Lens now In Stock at B&H Photo Video ! Tamron 28-75mm f/2.8 Di III RXD FE Lens now In Stock at Focus Camera ! The new Tamron FE 28-75mm f/2.8 Di III RXD lens now back in stock at Focus Camera. Only a few left in stock, order ASAP before soldout ! Author adminPosted on November 22, 2018 November 22, 2018 Categories Sony E-mount Lenses, Tamron FE LensTags In Stock, Tamron 28-75mm f/2.8 FE Lens In Stock TrackerLeave a comment on Tamron 28-75mm f/2.8 Di III RXD FE Lens now In Stock at Focus Camera ! 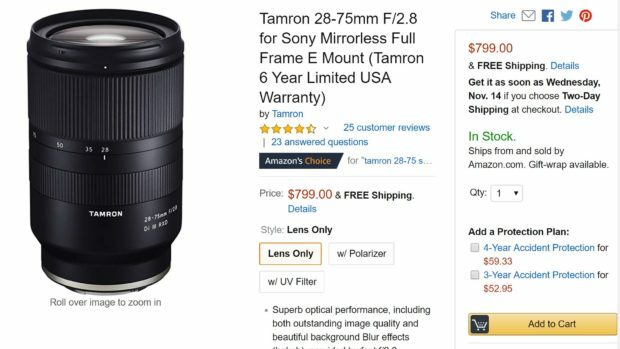 The new Tamron FE 28-75mm f/2.8 Di III RXD lens now finally in stock and shipping at Amazon US. The US price is $799. This is one of the most popular FE lenses currently for Sony full frame mirrorless cameras. Sony FE 24mm f/1.4 GM Lens Back In Stock at Focus Camera ! Sony FE 24mm f/1.4 GM lens now back in stock and shipping at Focus Camera. You can also pre-order this lens at Amazon/B&H Photo Video/Adorama/WEX/ParkCamera. Author adminPosted on October 31, 2018 Categories Sony E-mount LensesTags FE 24mm f/1.4 GM Lens In Stock Tracker, In StockLeave a comment on Sony FE 24mm f/1.4 GM Lens Back In Stock at Focus Camera ! 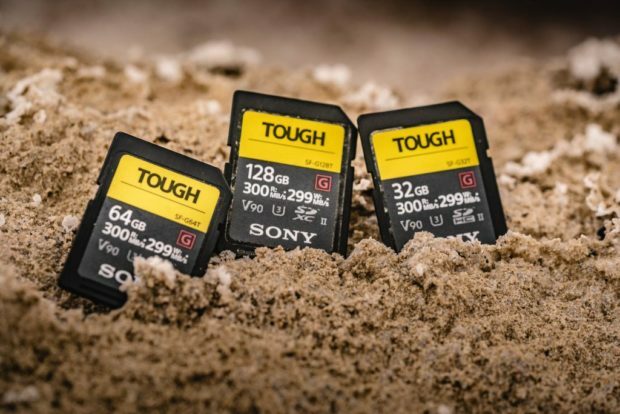 The new announced Sony SF-G Tough UHS-II SDXC memory cards now in stock and shipping at Amazon/B&H Photo Video/Adorama. Sony FE 24mm f/1.4 GM Lens now In Stock at Focus Camera ! The new announced Sony FE 24mm f/1.4 GM lens now finally shipping in Amazon/B&H Photo Video/Adorama/WEX/ParkCamera, and currently in stock at Focus Camera. Author adminPosted on October 26, 2018 October 26, 2018 Categories Sony E-mount LensesTags FE 24mm f/1.4 GM Lens In Stock Tracker, In Stock, Sony FE 24mm f/1.4 G Master LensLeave a comment on Sony FE 24mm f/1.4 GM Lens now In Stock at Focus Camera ! 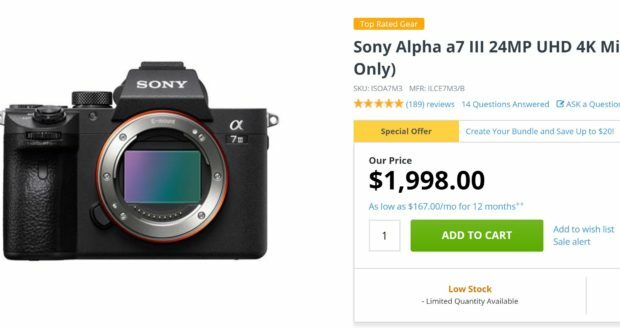 Sony a7 III & Tamron FE 28-75mm f/2.8 Lens now In Stock at Adorama ! The new Sony a7 III body (Adorama) and Tamron FE 28-75mm f/2.8 DI III RXD Lens(Adorama) now in stock and shipping at Adorama ! Author adminPosted on October 7, 2018 October 7, 2018 Categories Sony E-mount Camera, Sony E-mount Lenses, Tamron FE LensTags In Stock, Tamron 28-75mm f/2.8 Di III RXD Lens, Tamron 28-75mm f/2.8 FE Lens In Stock TrackerLeave a comment on Sony a7 III & Tamron FE 28-75mm f/2.8 Lens now In Stock at Adorama !